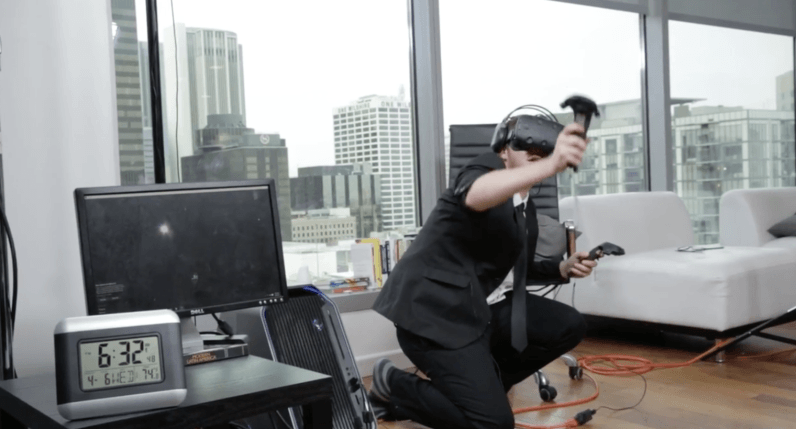 Proving not all heroes wear capes, Derek Westerman swapped reality for virtual reality as he donned a HTC Vive and painted in VR for 25 hours. Guinness was game to get the record on the books, but it had a few stipulations and one of them was that the record had be attempted with a single game. According to Westerman, he chose a ‘Tilt Brush,’ a virtual painting experience that allows you to create pretty much anything out of a complete void. In case you’re wondering about human needs that may arise in the course of a 25 hour span, Westerman ate, drank and even urinated in a bucket while sporting the Vive headset; he later threw up in the same bucket at around the 17 hour mark. It’s actually surprising he made it that long without throwing up, as VR makes a fair number of people nauseous almost immediately. Even one of our own only managed a few minutes of Minecraft VR before reporting severe nausea. 25 hours playing a game that’s basically a dark empty room (until you start creating) sounds like Guantanamo-level torture. But, Westerman persevered and because of this heroic feat, he now holds a Guinness World Record.